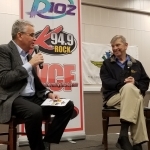 Indianapolis Motor Speedway Historian Donald Davidson has been coming to Danville since 2017 to talk with local Indy 500 racing fans about the connections that Danville & Vermilion County have with the Speedway. On March 26, 2019, Donald was at Turtle Run. Mike Hulvey lead a talk about many topics including the 50th anniversary of Mario Andretti’s historic win at the track. You can listen to the program here, or watch video below.